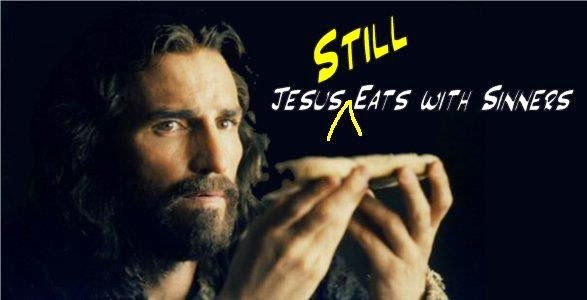 People noted that Jesus ate with sinners. This was certainly true. It wasn’t just the “sinners” that Jesus ate with at dinner parties. On a regular basis Jesus sat down to eat with his sinful followers. There was Judas, the greedy treasurer of the group. Arrogant and boastful Peter was there also. So were James and John, the hotheads that Jesus nicknamed the “Sons of Thunder”. Does anyone really think that Matthew was an honest tax collector? What about Simon the zealot? Surely there was blood on his militant hands. They were all sinners, and yet Jesus ate with them. Whenever we participate in communion, we celebrate the fact that Jesus still eats with sinners. “If we claim to be without sin, we deceive ourselves and the truth is not in us.”—1 John 1:8. This entry was posted in Christian Living, Communion Meditations and tagged 1 John 1:8, Eats with Sinners, illustration, Jesus eats with sinners, sin, sinners. Bookmark the permalink.